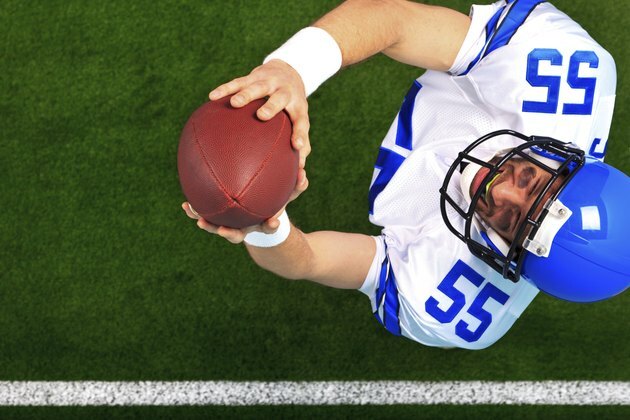 Shucking away an offensive lineman or stiff-arming a chasing defender is good football technique, but it may put you at risk for a wrist injury. Many ligaments in the wrist can stretch or tear if you don't protect them. In more severe cases, you may break a bone in your wrist. In addition to performing regular wrist-strengthening exercises, taping your wrist may help you prevent season-ending injuries. Apply prewrap tape to the wrist. Start 2 to 3 inches below the bend of your wrist, closest to your body. Continue wrapping until you are 1/2 inch past the bend of your wrist. Do not apply too much tape. You only need one layer between your skin and the adhesive tape. Tape adhesive tape over the prewrap tape. Start applying your adhesive tape 1/2 inch below your prewrap tape, so half the width of the tape will make direct contact with skin. Continue wrapping the tape around the wrist. Make sure you half overlap each previous wrap of tape. Use moderate pressure, but do not make it too tight. Wrap until you are 1/2 inch past the the prewrap tape around your wrist, so that the adhesive tape makes contact with the skin. Be advised that the tape will loosen with football play. Perform the capillary refill test after applying tape to make sure you have adequate circulation. Squeeze a fingernail until it turns white. Release and ensure the fingernail turns red within a few seconds. Always make sure you don't experience numbness or tingling in the hand. Your taping skills will improve with practice. Practice regularly on yourself or a teammate. Never continue football activity if the wrist is red, swollen, deformed or severely painful.